Ring in 2014 with Małe Instrumenty: The Politics of Tiny Instruments in Poland. 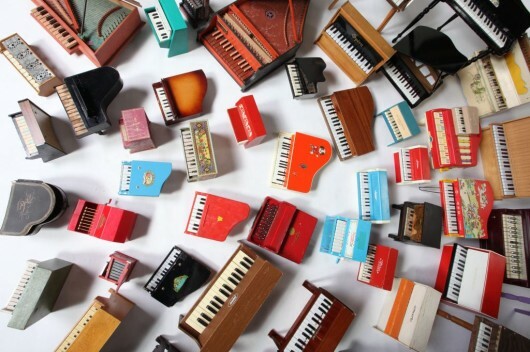 This New Year, as we emerge from the season of sales and the scourge of shopping, Małe Instrumenty offers a different kind of gift: music played on toy pianos. Yes, Virginia, toy pianos. Toy pianos, children’s music boxes, and found-object instruments, played by Pawel Romańczuk, Marcin Ożóg, Tomasz Orszulak, Jędrzej Kuziela and Maciej Bączyk, the members of Małe Instrumenty who hail from Wrocław, Poland, where I taught last summer. I’ve told the story of how I came to know about Małe Instrumenty to anyone who will listen and wrote about the band briefly on NSSR’s blog Public Seminar.But it was only over this holiday break that it dawned on me that their project was, in fact, quite political. Where late 20th-century Polish theater and performance was a refusal of the institutionalized repression of freedom by a corrupt Warsaw Pact government, Małe Instrumenty offer a modest yet powerful rebuttal to another kind of institutionalized control—the neoliberal rule of acquisition, accumulation, and social atomization. During the 1970s and 80s in communist Poland, actors leveraged the power the everyday in the face of the seemingly intractable power. In Performative Democracy, my colleague and friend Elzbieta Matynia offers an instructive history of what she dubs the Young Theater movement. Among them were the Eighth Day Theater, which produced a performance in a blood donation facility in Łódź that spoke to the routinization of social violence (1) and the Warsaw-based Academy of Theater, which used apartment buildings as stages, enlisting their residents as performers (2). Groups such as these that made it possible for ordinary citizens to speak about their lives and played a critical role in defeating the forces of censorship. Today, I see Małe Instrumenty as offering another kind of resistance. (Though I must admit that their music had so overwhelmed my senses that it took a while for me to recognize it.) First, there is the very fact of their decision to make music with discarded toys. This is a larger idea than simply salvaging the casual products of capitalism like Barbie pianos and other plastic instruments intentionally made to be short-lived. Małe Instrumenty recuperates the joy of childhood and our lost knowledge of how to make do. Which brings me to my second point: the sheer inventiveness they bring to the notion of an instrument. When I watched Pawel draw a bow over a series of emptied tin cans nailed to a stick and produce the vibrato of a violin, I was once again struck by the possibilities we can find in things, derive from things—things in wise hands. Some I know would not call hand-made instruments “design” and would characterize the members of Małe Instrumenty as artists. But perhaps this is design after all, just done in reverse. When Małe Instrumenty take the detritus of mass production (toys, tin cans, bicycle bells), give it new life, and distribute it on a mass scale through media like YouTube they seem to render such distinctions moot. Małe Instrumenty are sound designers, object designers, and if our mutual friend Agata Gniebna has her way, social designers. Agata told me she wants to raise funds to build a giant-sized toy piano in one of Wrocław’s public spaces, so children can play it and play on it. It may be that the real gift of Małe Instrumenty is their recognition of the power of scale—always an element of design. 1. Elzbieta Matynia, Performative Democracy, (Boulder, Colorado: Paradigm, 2009), p. 21. First published on January 2nd, 2014 on Parsons The New School for Design, Design Studies website.